Clarke said the indie film, which is in limited release on Friday, doesn't try to sensationalize the accident, which Kennedy failed to report for nine hours. He said the film sticks "to the facts as much as we could and to play it out without scandalizing, without going to the tabloid of it." "This man committed this act and he worked his way out of it with help and with his own moral journey to the other side, where he then became one of the longest-serving senators in history. I don't think — partisanship aside — you can't take away from what he did." Kennedy went to Martha's Vineyard to race in the Edgartown Regatta and on the evening of July 18, 1969, attended a party at a rented house on Chappaquiddick Island. Guests included Kennedy friends and several women, including Kopechne, who had worked on the presidential campaign of his brother Robert F. Kennedy, assassinated a year earlier. Kennedy and Kopechne, 28, left the party together and a short time later their car plunged into Poucha Pond. Kennedy escaped from the submerged vehicle and said he made several futile attempts to rescue Kopechne, who was trapped inside. "It's pretty much unchanged apart from the bridge itself has got guard rails and wider. There's no other buildings. The Dike House is still there, the same place. It's dark. There's no lights on the road," he said. "The water is dark and the current is strong." "I think I held my breath for five seconds to see where I came up. And I came up a big distance away," Clarke said. "You can be with Ted a bit. You cannot just externalize it and say bad, horrible, disgusting man. You might want to at the end, but you can be there for it: on the phone afterwards, the walk back, the swim, the lies, the made-up story — or perhaps it's actually really what did happen. But you can actually stay there with Ted. Not enough to be a Kennedy, but enough to almost touch him," he said. "We all have earlier versions of ourselves that we're not crazy about. At least I do," he said. "So there is something very interesting about the journey that Ted goes through, and being exposed to his relationship with his father," he said. "Look, it's not a documentary, but there is an attempt to be objective and ask objective questions." 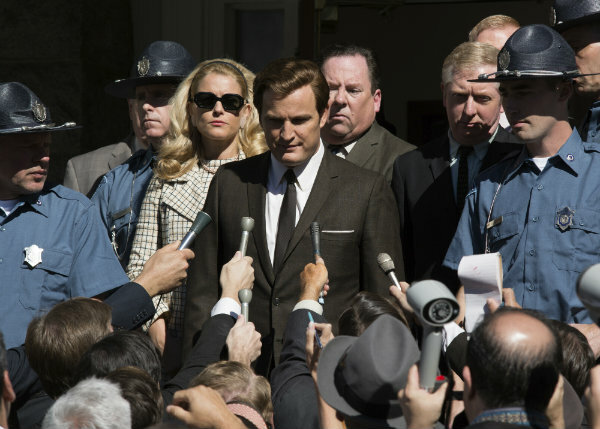 Review: Director John Curran's "Chappaquiddick"